Dissolve the yeast in lukewarm water and place it in the mixer bowl. Add the sugar, olive oil, salt, then slowly add the flour, and knead until it becomes a soft dough that does not stick. Put the dough in an oiled bowl and cover it with a clean kitchen towel. Leave the dough to rest in a warm place for about 30 minutes until it rises. Melt the butter in a non-stick pan, add the finely chopped parsley and the garlic and stir. Sprinkle some flour on the kitchen countertop, knead the dough, and divide it into pieces of about 40 grams. Then open each piece of dough, put half a teaspoon of mustard, a little grated mozzarella and close it, making a ball again. 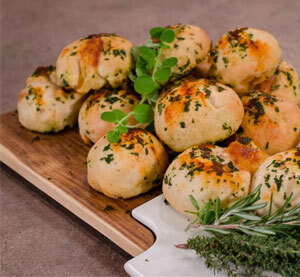 Place the stuffed dough balls on a baking sheet covered with greaseproof paper, sprinkle with a little more mozzarella and pour the aromatic parsley pesto. Sprinkle with paprika and bake in a preheated oven at 200oC for about 8-10 minutes until they rise and turn golden brown.